A place to post projects and share my Ordinary life with others. I'm new at quilting. I started last August with my first class. 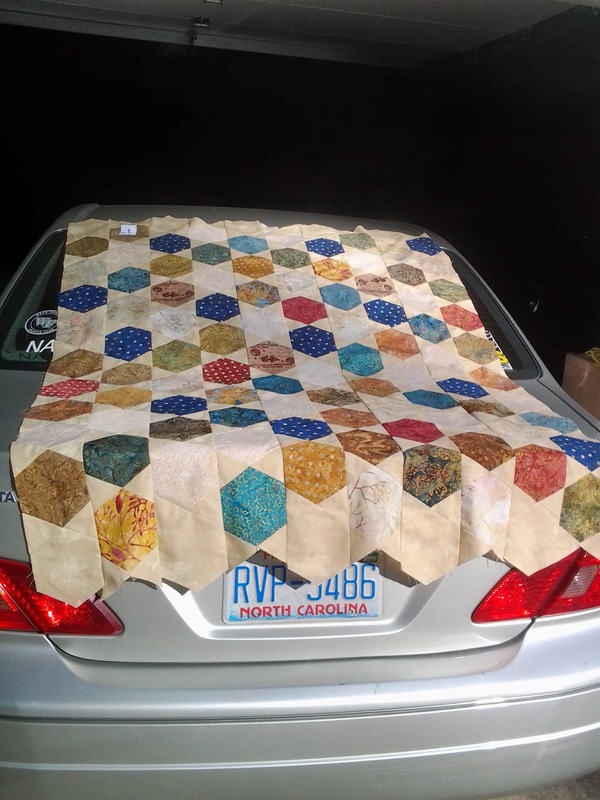 This is my 2nd quilt :). I have the top and back ready for the sandwich - just need to get some batting this week. It is so NOT square - lol - but I don't care. I'm still learning and hopefully will get better - I am horrible with 1/4 inch seams even with a 1/4 inch foot - lol. I blink and it goes crooked. This is my first share of a WIP. Thanks for looking. OH this quilt is for my son. I'm calling its Gettysburg. I used 2 HOPE CHEST BATIKS by Edyta Sitar Laundry Basket Quilts for Moda Reproduction Fabric Collection hexagon charm packs for the main hexies and added fillers with Gettysburg Gettysburg Address and Gettysburg Battle Names by Kensington Studio fabrics to have enough hexies for a lap size quilt. The back which I'm not showing is made from Gettysburg Map by Kensington Studio. I don't remember the name of the fabric I purchased for the background. Yes - My son and husband are Civil War buffs. This is a surprise for my son. He is almost 20 and in college so hopefully he will like it - lol. If not, Dad can have it to use. An Easter card for my neighbor. I used the Visual Designs by Chris April Challenge Sketch to make the card. The monthly sketch files are created by I Scrap Designs. I also used I Scrap Designs IR00018_Easter_Egg_Hunt_with_grass. I cut X piece, the oval rings and the small squares using the sketch file. The Easter sentiment and the small eggs were cut from the other file. The rest of the pieces were cut by hand. Here's another Christmas card. This was made with non-traditional colors. 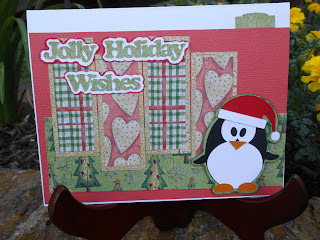 Another Card a Day blog challenge was Christmas Animal card. The penguin is here at VisualDesignsbyChris. The card layout was the Sept Sketch challenge there. I made the traditional color card for that challenge. See it below the one I made for Card a Day. Christmas is in the air here - the weather is finally cooling off :-). I'm hoping we'll have some white stuff sometime this winter. We don't get much. I started making Christmas Cards in late August. I like to sit in the evening and make cards as my relaxation while I watch TV. And Christmas cards are my favorite type to make. I got started last year around this time with Card A Day Blog when the challenges were for Christmas cards and it's that time of year again :-D. This is Card A Day Blog's first Christmas Card challenge. I made this card with scrap strips of Christmas paper. I added a tree charm from ACharmingPlace, which I decorated with white mini brads. Hope you like. I made this Birthday Card for a friend's daughter whose birthday is October 31 :). I'm using it for one of A Card a Day Blog's challenges. I combined 3 KNK files to make it. The Happy ghost is from Visual Designs by Chris (CD00592). The "Happy" is I Scrap Designs Happy Halloween Web Card (IR00249) and the "BOO!" belongs to Sam and Hailey Design's Itty Bitty Halloween Creeps (JB00195) file. All these can be found at VisualDesignsbyChris. I did the "thday" piece myself. Thanks for looking! Here's another card for the Card a Day Blog challenge. It's a Canadian Thanksgiving card. 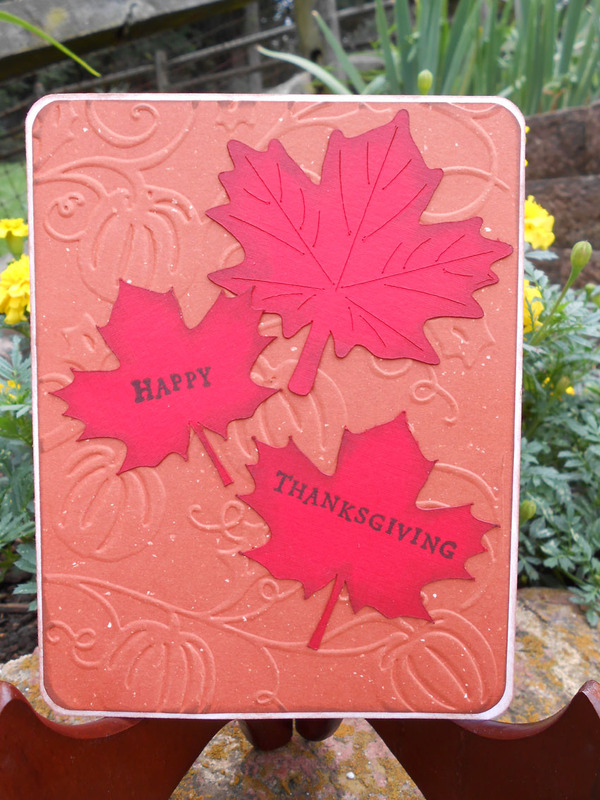 I used a cuddlebug embossing folder for the background of pumpkin and vines. I cut the leaves using Sam and Hailey Designs Itty Bitty Autumn Leaves file (JB00219) available at VisualDesignsbyChris. and SU! "Happy Thanksgiving" stamp from Teeny Tiny Wishes set. I'm an admitted scrapbook addict! I also stamp and alter items. My other hobbies are reading and gardening.